Weight at Rescue: 15 lbs. Moses is a wild-born bobcat that was discovered by some people when he was about a week old next to a creek that ran along their property. Since he was soaking wet and the water level was high due to heavy rainfall, they assumed he had been washed down the creek. They took him in and called a local wildlife organization who advised them to take him back to the creek and place him in a carrier with the door open in hopes that his mother would return for her kitten. Unfortunately, the reunion never took place as the well-meaning people would take him to the creek during the day and bring him back in their house at night to sleep in their bed. 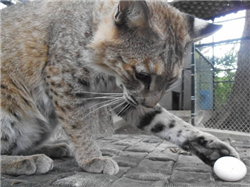 Since bobcats are nocturnal, mama cat never came for him and the little kitten formed a bond with his new parents. After about a week of failed attempts, they contacted the wildlife organization who instructed them to take the kitten to a wildlife rehabilitator. The rehabilitator treated him for worms, coccidia and dehydration, but due to lack of space and prior commitments turned him over to a second rehabilitator. The second rehabilitator worked with the kitten for months. She did everything she could think of to bring out his wild side, but to no avail. This sweet, little guy just kept purring. 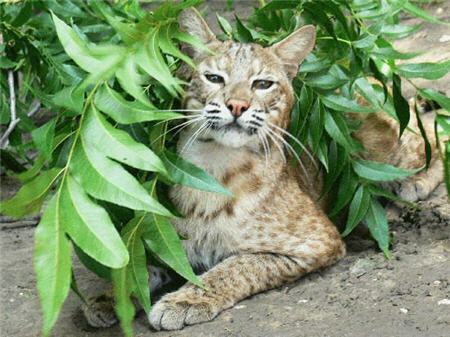 Since he probably had a lot of loving, human contact at such an early age, Moses has come to trust people….a death sentence for a bobcat living in the wild. 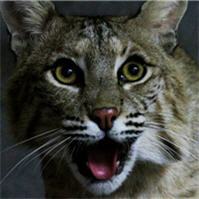 In January 2007, the rehabilitator gave the 9-month old bobcat kitten to In-Sync, knowing he would be surrounded by loving, nurturing people. Appropriately enough, we named him Moses. Moses shared an enclosure with Zacc until Zacc’s death in October 2008. He loved Zacc despite their age difference and was very protective of him. Moses now shares a big enclosure with Otis whom he once thought of as a threat to Zacc. The two have become fast friends. Although we wish Moses could have a life of romping and playing free in the wild, we are very glad he has joined our family.